I am delighted at the republication of Mgr Ronald Knox's translation of the Bible. It was my father's favourite translation and I can remember the trouble he went to in order to replace a lost edition of the New Testament. Mgr Knox was a distinguished priest of the Diocese of Westminster and such a gifted preacher and giver of retreats. His memorable phrases are still quoted. He brought that same skill, together with considerable scholarship, to the immense task of Biblical translation. Many will welcome this new publication of his achievement. Mgr. Knox's version continues to merit attention, and I welcome the publication of this new edition, as his remarkable work is likely to continue to be of interest for many years to come. I sincerely hope that many will read and profit from this new edition. Ronald Knox's translation of the Bible remains an exceptional achievement both of scholarship and of literary dedication. Again and again it successfully avoids conventional options and gives the scriptural text a fresh flavour, often with a brilliantly idiosyncratic turn of phrase. It most certainly deserves republication, study and use. The English Bible tradition, which this translation by Mgr Ronald Knox so aptly embodies, is an important part of western culture. It continues to shape the English language and literary tradition, not just in Britain but in the United States, Australia and elsewhere. 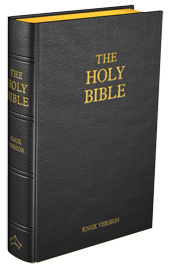 This handsome edition of 'The Knox Bible' is a worthy book for private study and devotion, sure to bring about a deeper reverence and love of Sacred Scripture, and so draw readers into a deeper relationship with our Blessed Lord, the Word who 'was made flesh, and came to dwell among us' (Jn 1: 14). As the fulfillment of Blessed John Henry Newman's hope for a worthy English translation of the Bible, this translation holds a special place in the hearts of those of us, who - like Newman and Knox and countless others - have found their way to the fullness of communion, united to the Apostolic See. May it help bring others to know the Lord who is 'truth and life' (Jn 14: 6). Msgr. Knox had a profound love for Sacred Scripture, a passion was to make the Bible accessible to as many people as possible … In the Knox translation, clarity is paramount. Praiseworthy achievement … a monument of many years of patient study and toil. There has been a remarkable revival of interest in Ronald Knox in recent years, and the republication of his magnum opus is a significant event. Fr. Ian Ker, a leading authority on John Henry Newman and direct relative of Msgr. Ronald Knox. … the outstanding feature of Msgr. Knox's biblical translation is the way he maintained the Hebrew alphabetic acrostic (succeeding verses starting with succeeding letters of the Hebrew alphabet) of parts of the Old Testament over into an English alphabetic acrostic (succeeding verses starting with succeeding letters of the English alphabet). In an alphabetic acrostic the initial letters of lines (or verses or sections) follow the sequence of the letters of the Hebrew alphabet and the lines/verses/sections are of roughly equal length. The Hebrew alphabet has 22 letters and many of these acrostics have 22 verses or a multiple thereof, the acrostic sometimes being used to determine verses. The most complete alphabetic acrostics in the original language of the Hebrew Bible are Psalms 25, 34, 37, 111, 112, 119, 145; Proverbs 31:10-31 (the Praise of a Good Wife); and each of the first four chapters of the Book of Lamentations. Psalm 119 is, of course, the supreme example of an acrostic in that it has 176 verses consisting of 22 strophes (one for each letter) each of 8 verses. All 8 verses of the first strophe start with Aleph, the first letter of the Hebrew alphabet. The second 8 verses all start with Beth, the second letter, and so on. Even if one cannot read Hebrew (I can't), it is worthwhile looking at a Hebrew Bible (I have one in the hope of eventually learning) to see this unique example. Many English translations indicate this alphabetic feature by labeling the 8 verse strophes with the letter of the Hebrew alphabet. It is hypothesized that alphabetic acrostics may have functioned to show a completeness or totality, we would say "from A to Z". Thus in Lamentations the utter desolation, in Ps 111 the completeness of praise, and in Ps 119 that the "Torah", i.e. the instruction, of the LORD is totally good. Needless to say, the alphabetic structure of the original is not usually able to be carried over into English translations. But there is an existing English translation of the entire Bible which tries to do justice to the form of the Hebrew alphabetic acrostic. This is the Knox translation, an older (late 1940's-50's) Roman Catholic translation done by Monsignor Ronald Knox, a convert from Anglicanism. I have used it in the past in Bible Study groups to illustrate an acrostic. "At Ronald's death the Roman Catholic Church in every English-speaking country lamented the loss of a rich ornament, and the story unfolded in pulpit and newspaper was one of the cherished and privileged survivor of a golden age. The brilliantly precocious youth, cossetted from childhood; the wit and scholar marked out for popularity and fame; the boon companion of a generation of legendary heroes; the writer of effortless felicity and versatility; the priest who never bore the burden of a parish or a diocese, but always lived where he chose, in patrician country-houses and university common-rooms; who was always the 'special preacher' on great occasions; who never lost a friend or made an enemy; the man whose exquisite politeness put everyone at his ease; the translator who brought the Vulgate to life for his own generation and for the future; the author of numberless unrecorded, unforgotten quips - this, is it not?, is rather the impression left by the obituaries. But genius and sanctity do not thrive except by suffering. If I have made too much of Ronald's tribulations, it is because he hid them, and they must be known to anyone who seeks to appraise his achievement." "Ronald Knox was the most original and eloquent writer of the century." "Knox was a bright star whose work was unflaggingly wise, urbane, witty and all done in the purest prose imaginable." "He had used the weapon of laughter in addressing himself to people who could no longer laugh, and the weapon of reason in talking to people who could no longer think and the weapon of knowledge in informing people who were indifferent to fact." “And now we are naturally brought on to our third point, which is on the characteristics of Holy Scripture as compared with profane literature. Hitherto we have been concerned with the doctrine of these writers, viz., that style is an extra, that it is a mere artifice, and that hence it cannot be translated; now we come to their fact, viz., that Scripture has no such artificial style, and that Scripture can easily be translated. Surely their fact is as untenable as their doctrine.